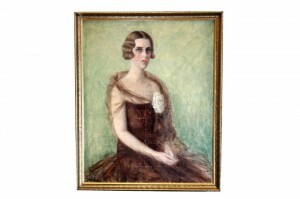 The portrait of HRH Princess Olga Yugoslavia the wife of HRH Prince Paul of Yugoslavia by Ivan Radovic, belongs to the works of art for which there are no preserved documents about the acquisition or order. The painting was found in the Royal Compound Art Collection, with extensive damage in the centre. Surprisingly the painting was first mentioned in the inventory only in 1981, and even then as a “picture with no frame”. Although The White Palace was the residence of TRH Prince Paul and Princess Olga, it cannot be determined with certainty that the portrait was commissioned specifically for this representative area. Moreover, it is not possible to determine when the portrait was commissioned, since Princess Olga is not shown with any attribute that would identify her as the wife of HRH Prince Regent Paul of Yugoslavia. All the features of Radovic’s portrait represent an elegant young noblewoman from the 30’ of the last century. It is a representative, but not an official portrait of the Princess. She is portrayed as sitting, a proud aristocratic posture, hands joined in her lap slightly and head turned towards the viewer. A special feature of the portrait is Princess Olga’s piercing gaze, clearly directed at the viewer. This shows not just the power of her personality, but even more a clear awareness of her social status. Like many portraitists of his time, Ivan Radovic painted the Princess in a formal evening gown, which by its elegance and simplicity speaks of its owner’s refinement, while the colours fit into the very figure of the noblewoman. The dress design and the Princess’ hair can date the portrait in the 30’s of the twentieth century. Radovic repeats the dark brown shade of her hair in the colours of the dress and a translucent veil that lightly covers her arms and shoulders. The same colouristic repetition is evident in the colour of her skin and the white flower, the only decoration on Princess Olga’s dress, as well as in the blue-green shades of her eyes that is repeated with variations on the portrait’s simple monochrome background. In this way Radovic got a very compact, colouristically complete work, and therefore visually very striking portrait. Ivan Radovic (1894-1973) was born in Vrsac. He graduated at the Academy of Fine Arts in Budapest in 1919, in the class of Professor Istvan Reti. His journeys to Prague, Paris, Venice and Vienna had great importance for his artistic development. In 1922 Radovic participated in the 5th Yugoslav Exhibition in Belgrade, and he had his first solo exhibition in Belgrade in 1925. Since 1926 Radovic was a member of the art group “Form”. He worked as a professor at the School of Art in Belgrade from 1932 to 1940. After the World War Two ‘he became a member of ULUS, and in 1954 a member of the art group “Six”. In 1971 he became a corresponding member of SASA.